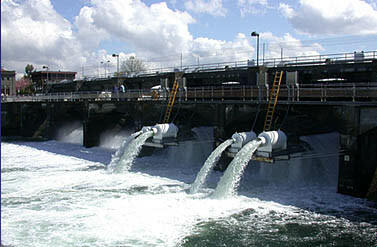 The Locks are made up of 2 navigational Locks, a dam and spillway, a fish ladder, a botanical garden, and a regional visitor center. 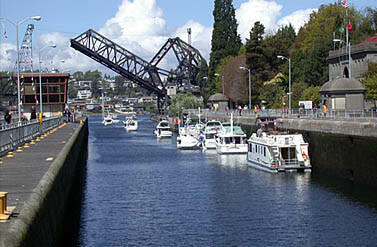 The Locks allow vessels to pass from fresh water Lake Washington, into the salt water of Puget Sound. An amazing place and an amazing engineering feat. 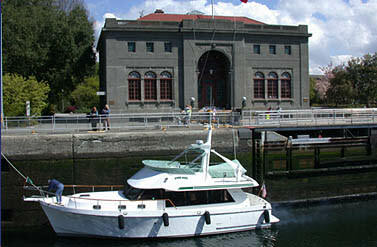 The Hiram M. Chittenden Locks, were built in 1911 and are operated by the U.S. Army Corps of Engineers. View the Botanical Garden featuring a wide array of blossoming trees, shrubs, and flowers. 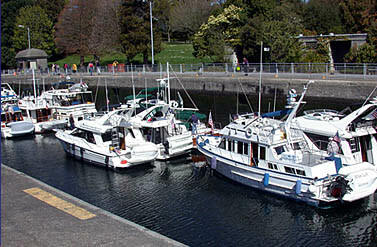 You will enjoy watching the vessels as they transit the Locks and probably witness out-going smolt and returning sockeye salmon in the fish ladder. Peak time for viewing sockeye (the largest run of salmon) is right around the 4th of July. The sockeye run is a MUST SEE.